Have you ever heard that? Probably you have and for good reason. Recent polling indicates that 30% of people spend the majority of their time at home in the kitchen. It further says that over half the time you are visiting with friends it is in the kitchen instead of the living room. Could your kitchen cabinets use a face lift or makeover? By far the most cost effective option is to paint them. It will cost tens of thousands to replace kitchen cabinets in most homes. The cost of new kitchen cabinets not only is reliant on actual costs of the cabinets but who is going to install them? You also have to add on a countertop, backsplash, new sink. It adds up really fast and that is why it is a big decision to replace the kitchen cabinets. 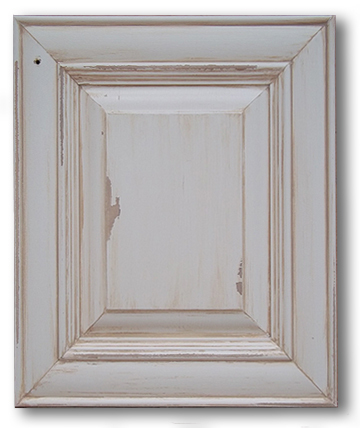 You may find yourself with a set of kitchen cabinets that are beat up, nicked, chipped and just plain shabby. You could spend tens of thousands – literally - to rip them out and replace or you could turn a lemon into lemonade like I did with the kitchen cabinets I transformed in my new tutorial 'The Painted Furniture Look'. I call this look I created "The Painted Furniture Look". The cabinet door above was a plain white kitchen cabinet door before I transformed it into a the trendy designer look of 'painted furniture'. In 'The Painted Furniture Look' tutorial I explain in a detailed step by step manner the exact techniques and materials I used to create this look. This look is a bold look and makes a strong statement. But it could be just the style you are looking for. There are a lot of resources on the web about how to paint household furniture to give it this look. 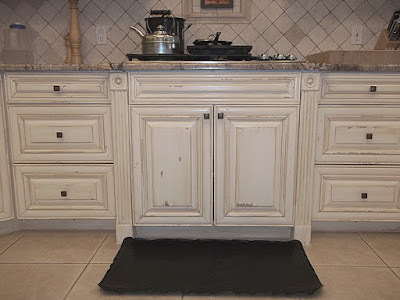 This tutorial is the only resource out there that explains how to achieve painting your kitchen cabinets with the painted furniture look and appeal. 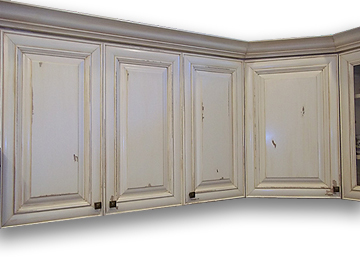 This tutorial is 97 pages in length, it has a total of 98 minutes of video and it contains 49 photographs to completely demonstrate how to create the 'Painted Furniture Look' on a set of kitchen cabinets. Here is one of the videos from the tutorial that show the completed kitchen cabinet project. There is a certain procedure to follow when painting kitchen cabinets. I go over in detail all the steps to take to ensure a successful project. Painting kitchen cabinets is a big project and not something you can do over the weekend. Because it is a big project you need know how to keep it organized. Given the amount of time most people spend in the kitchen you want to feel good about it. A makeover with 'The Painted Furniture Look' could give you just what you are longing for.